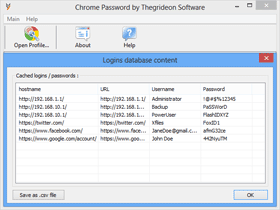 Chrome Password by Thegrideon Software is FREE password recovery tool for Google Chrome. Chrome Password allows you to recover / view logins and passwords saved in Chrome cache. Logins and Passwords are recovered instantly. Chrome Profile can be located automatically. Login Data - SQLite database with saved web addresses, user names and passwords. The file is stored in Chrome user Profile folder. Chrome Password locates user Profile folder automatically, loads user names and passwords from the database, decrypts passwords and allows you to view / copy or save recovered data as csv.